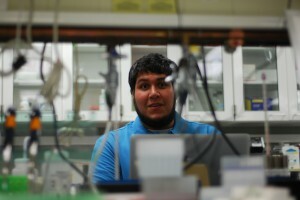 This BEACON Researchers at Work blog post is by MSU graduate student Luis Zaman. In my first BEACON blog post, I wrote about how we study the diversity producing effects of host-parasite coevolution in Avida. I used a traffic jam metaphor to explain how finding the least-used detour would get you home quickest. This example of negative frequency-dependence is particularly relevant for those of us experiencing Michigan’s Construction Season. In host-parasite communities, that same benefit of being rare can support a diverse set of organisms. I showed you a video from Miguel Fortuna of this diversity where you could actually watch as coevolution produced new interactions and new host or parasite “species.” In the time since, part of my research has been on understanding the structure of those interaction networks and the effects of diverse communities on coevolutionary processes. An evolved interaction network of hosts (green) and parasites (red) from Avida. Links represent actual infections between different host and parasite phenotypes (spheres). When looking at the networks of interacting hosts and parasites, we noticed an interesting pattern. The interactions weren’t random; instead they seemed to be nested such that specialist parasites tended to interact with hosts that more generalist parasites also interacted with. One way to understand this structure is to think about Russian Matryoshka dolls (or Russian nested dolls), where the smallest doll fits inside the next smallest, which fits inside the next smallest, all the way to the largest doll. But, instead of dolls, the hosts that the most specialized parasite interacts with are a subset of those hosts the second most specialized parasite infects, which are a subset of the hosts the third most specialized parasite infects, and so on… This pattern is also true for hosts in nested networks, where the most resistant host only interacts with the parasites that have the broadest host ranges. Russian Matryoshka dolls. After fully assembled, all the smaller dolls will be inside the largest doll. From plant-polinator interactions to resource-consumer modules in food webs, nestedness is found in nature nearly every time someone goes looking for it. We are excited to also see it in Avida! That means there is probably something about the evolutionary process that produces this pattern, since nearly everything about Avida’s “biology” is different from other living organisms. Even when we change details about how hosts and parasites interact, something we are uniquely able manipulate in Avida, we still end up with nested networks. We’re still trying to answer why coevolution produces this nested structure over and over again, but luckily Avida makes a particularly useful model system for this type of question. Miguel Fortuna, Aaron Wagner, Charles Ofria and I recently published a paper about the benefits of studying how these interaction networks evolve using Avida in a PLoS Computational Biology Topics Page. There are some interesting things about these topics papers, like how upon publication a copy is put up on Wikipedia for the community to edit and keep “alive,” but that topic is best kept for another blog post. Another big part of my time has been spent understanding how the diverse communities that arise affect future evolution. Because this diversity becomes part of the environment for hosts and parasites, it helps shape which traits are beneficial and which are harmful. Predicting what will happen in coevolving communities is extremely difficult because of this feedback, but that’s also what makes it fun and interesting to study. We have been wrapping up a manuscript describing a few interesting outcomes of this feedback, but you’ll have to wait for my next blog post to hear more about them. One result I’ll give away as a freebie is that parasite populations evolve to infect a wider range of hosts. This makes sense if you think back to the videos of the evolving interaction networks: after you have a diverse set of hosts, it probably pays off to infect as many of them as possible. I hope that by understanding how this ever-changing network of host and parasite interactions influences selection, we will also get closer to knowing why nestedness is so common in nature. For more information about Luis’ work, you can contact him at luis dot zaman at gmail dot com.